Taste test: These kettle-cooked potato chips had a vinegar taste was not overpowering to the point where your eyes will squint, and the oiliness of the chip worked well with the vinegar. A lot of salt on the chip rubbed off onto the fingers, as the sea salt had bigger "chunks" than normal salt, so keep a napkin handy. We could taste some strong vinegar by licking the powder off first; otherwise, the kettle-potato flavor dominated. 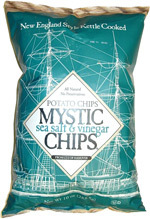 I'm on the fence as to whether these are better than Cape Cod's salt and vinegar chips. I may have to have an in-office chip-off to see what co-workers think. 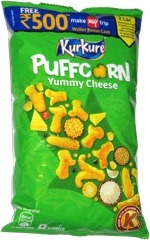 Smell test: A good aroma of vinegar wafts upward from the bottom of the bag, teasing your nostrils with its vinegary goodness.